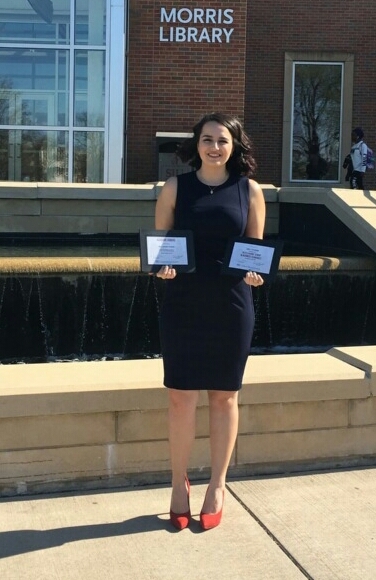 CARBONDALE, Ill. – Arielle Stephenson, a senior at Southern Illinois University Carbondale, finished in the top 10 as a solo debater at the National Forensic Association National Championship Tournament Lincoln-Douglas Debate. Stephenson, a business economics major from Torrance, Calif., competed over Easter weekend at the University of Wisconsin-Eau Claire. She finished in a tie for ninth place at the national tournament from a field of nearly 80 competitors. The SIU debate team has finished in the top 10 at a national championship for 11 consecutive years. Graham said the team is in transition to a different style of debate. In the future, SIU will focus on British Parliamentary debate, a style Graham describes as “the newest iteration of the evolution of collegiate debate” and the style with the most competitors, including those from top universities.